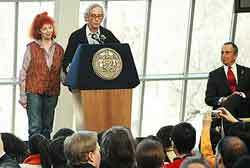 On February 11, 2005, New York's Mayor, Michael R. Bloomberg, welcomed Christo and Jeanne-Claude to The Metropolitan Museum of Art, where the artists held a press conference to announce the details of their creation, The Gates, Central Park, New York City, 1979-2005. 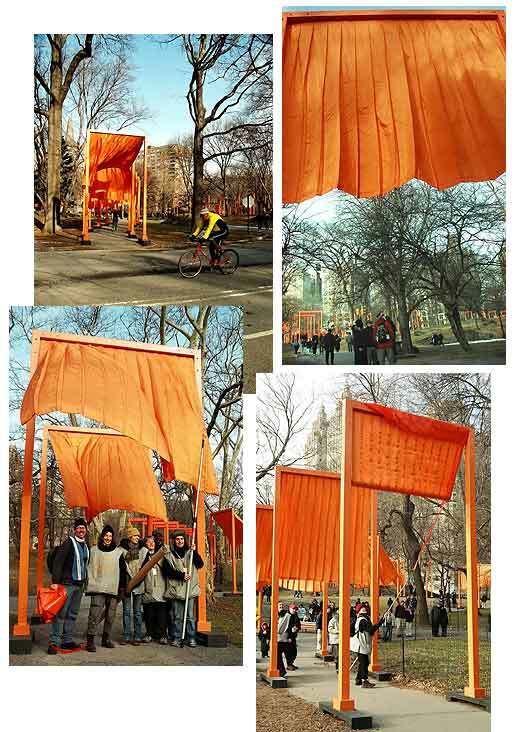 After more than a quarter of a century since it was first proposed, the 7,500 "saffron-colored" gates, which comprise 16-foot high posts with lintels that vary from six to 18 feet, from which hang nine feet of fabric, will adorn 23 miles of Central Park's pathways. The temporary work of art was on display from February 12th to February 27th, 2005. "Christo and I have created a work of art," said Jeanne-Claude at the opening of the conference. "It has no purpose. No meaning." She stated that the work needs no explanations or intellectualization, and that it is there for all to experience and enjoy. When asked what is the best vantage point to see the work, she responded, "Where you are," and added that each of us may have a different opinion when viewing the work, and, "each is valid." The couple explained that the panels of fabric were purposely left unfettered to the posts. "If they were connected, they wouldn't move freely," and, admits Jeanne-Claude, "the work has to do with freedom -- like gypsies who love to move around." Additionally, the succession of 7,500 pieces of rip-stop nylon moving capriciously in the wind will reveal the serpentine design of the park's walkways, while the rectangular posts will be a reminder of the grid pattern of the city blocks around the park. At the press conference prior to the opening, I asked Christo and Jeanne-Claude if there was any significance to the color of The Gates, having perceived the art as "Orange" rather than "Saffron," which, to me, is more red. I was promptly corrected by Mayor Blumberg that the color is "Saffron," and both Jeanne-Claude and Christo affirmed that there was no significance attached to the color. Still, I couldn't help thinking that as artists progress, they develop an intuitive knowledge of color, form, shape and design. Consequently, I find it difficult to believe that with Chirsto's extensive training and experience, augmented by Jeanne-Claude's contributions, these artists would select any color at random. 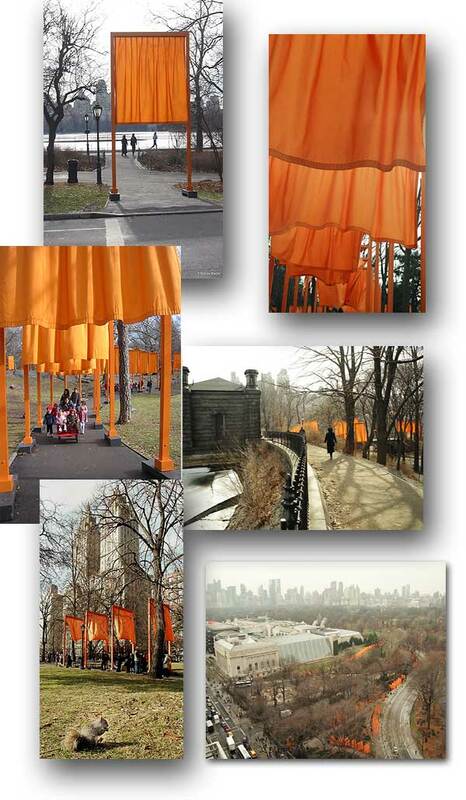 The Gates, the largest artwork in our City's history, were removed in 16 days, an aesthetic decision made by Christo and Jeanne-Claude to give their work a feeling of urgency to be seen. "These feelings are usually reserved for other temporary things such as childhood and our own lives. . . valued because we know they will not last." What will be remembered is the vitality that they created. The Park was overcrowded with visitors and residents who, for the most part, respected each other's space and the art they were viewing. And in light of the events that have occurred over the past several years, that's not such a bad thing. Christo and Jeanne-Claude put a much-needed smile on the face of New York City. The experience has added immeasurably to New York City's rich history of public art.